Société Auguste Vestris - Sticking to one’s position? The arrangement of musical notes - the Western scale with its tone/semi-tone intervals - situate us in a certain style of music, just as the characteristic ballet positions situate us within classical dancing. As the note sounds, there is the moment of attack, the vibration, a sound that grows, that fades, that dissipates. But even as it fades, there is activity. The interval is where we feel the emotion in music, the space between two notes. There is no such thing in music as a “static” note, where nothing is happening. The note changes. In dancing, unfortunately, a certain confusion is possible. It’s much easier for a teacher to aim at what a a “perfect” position would look like, and try to force someone into it, rather than try to explain the position’s inner dynamic, the flow of energy through the position, and through the dancer’s joints. Stationary as the positions may seem to the eye, they were never designed to be held! A position is a parenthesis, suspended, as though hovering somewhere. It resonates like a note of music, which though fading, is nonetheless living, and real. Dancers are generally taught to go from one position to another, and to believe that if only they could strike a better position, they would be a better dancer! Which is why our stages are cluttered with stick-figures in flat, static dancing. Makes for a very limited public ! Al this goes back to one, fundamental blunder: teaching what it should look like, than how things are done. Dancing for the Look will push the dancer to block the joints and clench the muscles to push himself into a position, rather than perceive that it is a movement of energy, or what in Alexander technique [[« The Alexander Technique is an extremely refined form of re-education or rather re-deployment of the entire muscular system and thereby, of many other organs ». Nikolaas Tinbergen, Nobel Price for Physiology and Medecine, 1973]], we call direction. And ballet is really a dance where the energy is always expanding, moving outwards from the centre of the body. Whence the beautiful ports de bras and so forth. But sometimes one touches a dancer’s arm at the barre, and it’s like wood! Rather than relaxed, and as though supported by the air itself, i.e. by an inner idea of direction and the flow of energy. The positions are in fact lines of energy, and the energy in ballet moves from the centre outwards. That is why a wonderful dancer can fill a stage by himself alone! And why people still flock to see good dancers. It’s also an expression of artistic generosity, that starts at the barre with the simplest port de bras. But where inner movement is lacking, the outer movement will suffer. “Classical dancing is freedom in a cage of positions” an old teacher of mine was used to say. I used to think that he meant that within the codified positions one can do a lot, but I’ve come to consider that the cage is bigger than we think. There is far more flexibility, more ease in the beautiful academic ballet positions. The conundrum is that if one stresses positions, one sacrifices freedom of movement, while if one stresses the latter, one sacrifices accuracy of position. It’s finding the balance. There are companies that insist on rigid perfection of positions, and for ten full minutes, I will sit back and admire that. Before I get very bored. Each ballet position has its own character, its own perfume and its own emotions. As in notes of music. But a held static position is the antithesis of dancing. A balance for example is dynamic, not a statue. The statues are in the Louvre. Dancing was never intended to come second to the positions! When we pronounce the word “classical dancing”, let the accent be on the word DANCING! It must be both classical, and dance. Consequently, the greatest difficulty involves “passing through” beautiful positions and lines, while creating beautiful movement. What’s interesting to me, is that a lot of pure, academic dancing is not really in fifth. The principal function of fifth, in terms of movement, is that it’s an intersection where we change weight, and move from one foot to the next. Observe those who move beautifully – they never stop in fifth! As far as teaching the positions, one of the main errors I have to deal with - aside from over-turning out - is the over-crossing. The Balanchinian over-crossed fifth, which wreaks havoc on a dancer’s body, seems to be back in vogue with a vengeance. This twists the spine and the hips so strongly! It’s unhealthy, can’t be maintained, and in a nutshell, serves no earthly purpose! Now let us look at the usefulness of the fifth, in and of itself. I love to end the grand plié exercise in fifth on flat foot, and ask people to release the energy from the hip-joint down into the ground, while releasing the torso and head into the air. Here we have the idea of what we are as Man! Grounded on the earth, but without losing our verticality, our dignity and above all, the spiritual connection to what lies above us. The fifth is used in dancing, often, for taking off and landing from jumps. That is why it’s essential to correctly place and teach the fifth in a demi-plié, with the idea that within the fifth, the dancer is actively rotating the legs. It is not a question of suppleness, which is an inborn physical trait. I ask the dancers to distinguish between ouverture, which is how your hips happen to be, and turnout which is a verb, it’s something you do. It’s the inner dynamic within the position. That’s how we protect our joints, and land from jumps without hurting ourselves. When I first arrived in 1976 I used to take class from someone who would shout at his students, to get them land from a grand jeté onto a perfectly turned-out foot. Every single week there was an accident. But he never questioned himself, no! It was just the stupid dancers! I teach students to think of a rotation from the centre of the heel-bone, which rotation will move up the leg into the hips. Although, as dance anatomy has shown, rotation does indeed start in the hips, the dancer’s experience of correct turnout, is moving up the legs. This certainly does not mean pushing the feet into an overly turned-out position. Anatomically the arm and leg are very similar. Anatomically the arm and leg are very similar. For example to open a jar I push and rotate the base of the palm first – without trying to do something funny in the biceps or shoulder! Rather than being about superficially turning the foot, it’s about the dynamic of the movement. In teaching the fifth position plié, for most students, there will be a little bit of space between the calf muscles. If they’re fully-pressed together, it will often mean that the back ankle is rolled – although that may also come from tucking under. The body can be compared to a family, who all get together to clean house on Sunday. 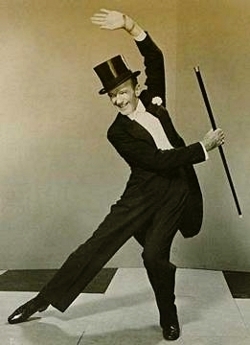 One does the living room, the other the bath …When the fifth is correctly placed, with the turnout spiralling up the leg, there is tremendous potential kinetic energy inside that position, which can move forwards, backwards, sideways, upwards, on the diagonal – a great potential of movement that can go anywhere, immediately. Since the upper body energy is flowing upwards, provided we use, rather than resist gravity, we have incredible power in the fifth. Just like the metaphorical family, all parts are involved with the movement to make the job easier. Unfortunately, one still sees instructors so focused on the foot position – in particular - that they lose sight of the fact that the body is a complex, built upon a series of inner connections and chains of reaction that are triggered by thought. As it happens, I have tried the « bits and pieces » approach, and to my mind, it does not produce results for the stage artist. I remember spending a week or more with students on the intricacies of the foot, and then on to the shoulder blades or the "petit basin" . People loved it. You do discover things about your body. The problem is that all this knowledge does not serve to correct poor habitual patterns, the inner dynamic. For instance the thought "Good grief, a pirouette ! » will unleash reflexes built up over the years - just as one starts to salivate merely thinking about biting into a lemon. The Alexander concept of "Use of the Self" can help the dancer to tap into the body’s natural functions as a coordinated whole, through simple directional thought. I turn now to the matter of the third position, which personally, I do not make much use of. It’s not that I’m against it. I ask people to use it as an “antidote”: when they have acquired a collection of so many bad reflexes, that all the fifth position does, is to unleash them. The third is most useful for teaching children, as a a doorway into the fifth. I would add that it can be quite effective for people who tend to roll their ankles in fifth. Using third breaks the reflex pattern, and helps build better habitual patterns. As for the oppositions – well, in any movement, there will always be a natural, opposing movement. Unless you are clenching a position, in which case, you will kill the opposition! We need to go back to a more classical approach in all the crossed positions. The dancer must remain aligned along his central vertical axis. I am dismayed to find people so over-crossed, that they’ll point fourth front with one hip eight or nine inches in front of the other, and then wonder why they can’t do anything. Well-intentioned teachers may believe that more is better. In preparing for a pirouette for example, although there is a lot of opposition, more is not necessarily better. 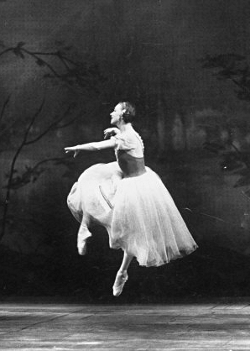 Balanchine on steroids so to speak – crossing way over, with the other shoulder pressed completely back. Then the dancer finds he has no central axis! Although many still believe that dancing is all about legs, the body is a unity, and a change in any part will move another. The back participates actively in all of this. There are dancers with such tight fifths that something has to give somewhere. The pelvis drops, the lower abdomen drops, thus cutting off the connection between the legs and the upper body. Their lower backs are very tight, and the spine is usually strongly pushed forwards. They can’t breathe, they get depressed, and keep falling off their axis. Poor training! The legs have a job: to transport the body from point A to point B. But if we’re talking only about legs, and the rest of the body is mere decoration, it’s Riverdance - a deep misunderstanding insofar as classical dancing is concerned. The Ballet is the entire body, the spirit, the mind and the soul. Edition 1982 du Manuel de la Méthode Cecchetti (Beaumont & Idzikowski, 1922). A noter la « petite » première et la précision des deux quatrièmes ouverte et croisée. tandis que celle de droite est « Cinquième incorrecte ». C’est Lesley Collier, alors étoile à Covent Garden, qui a posé pour ces clichés.